CD reviews: "Duke Ellington and His Great Vocalists" and "Count Basie and His Great Vocalists"
These reviews first appeared in the September 22, 1995 issue of the North County Blade-Citizen (now North County Times). Well, jeez, what can one write about these two releases without gushing? Two of the greatests (okay, arguably the two greatest) big bands captured during their glory years with some of the best jazz and blues singers fronting them? 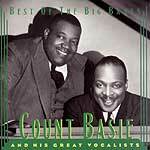 You pair Basie and Ellington with singers like Jimmy Rushing, Bing Crosby, Rosemary Clooney, Helen Humes and Earl Warren, and it's pretty hard to lose. Consider that the songs include "I Can't Believe That You're In Love With Me," "All of Me," "I Want a Little Girl," "It Don't Mean a Thing (If It Ain't Got That Swing)", "Don't Get Around Much Anymore" and "Take the 'A' Train," and you begin to understand the scope of these two compilations. Adding even more luster to these sets is the fact that the masters of these half-century-old tracks (the recording dates range from 1932 to 1959) have been digitally remastered  meaning they sound even better here than they did on vinyl.